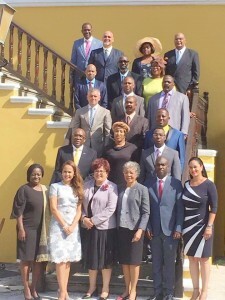 WILLEMSTAD – This morning 19 Members of the new Parliament were sworn in by the Governor of Curaçao, H.E. Lucille George-Wout. Two were absent. These two are Amparo dos Santos and Menki Rojer, both of Korsou di Nos Tur (KdNT). In her speech, the Governor claims that the country needs order following the contradictions that have come to light in recent times. She specifically mentioned the Constitution, the Rules of Procedure and the Rules of Order of Parliament. During the first session of Parliament following the swearing in ceremony, a positive atmosphere was prevailing. Contrary to previous times, all parties agreed with the new President of Parliament, William Millerson who was appointed on behalf of the PAR and Vice President Giselle McWilliam on behalf of the MAN. The governor has also called on Eugene Ruggenaath today to become the ‘formateur’ of the proposed cabinet of PAR, MAN and PIN.